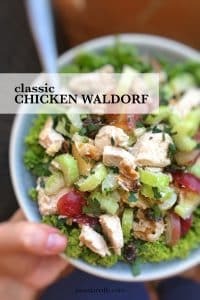 Chicken Waldorf Salad (Classic Recipe) | Simple. Tasty. Good. Before I start talking about the chicken waldorf salad below, first this. You have no idea how excited I am at this very moment! First of all: KitchenAid sent me a new attachment kit for my Cook Processor: a slicer and shredder! And second: this is the very first time ever that I actually make a recipe video – and it looks quite decent as well! 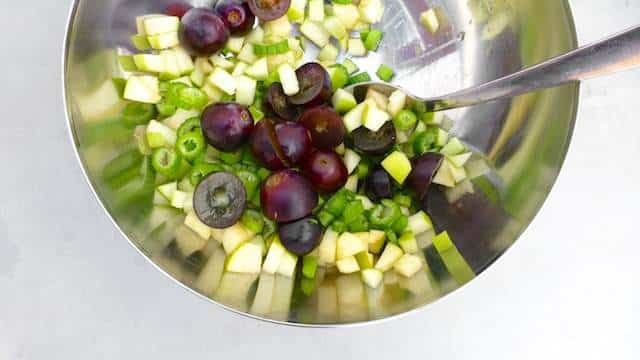 It’s a quick overview of how I prepare a chicken waldorf salad in my Cook Processor: you can find the list of ingredients below and a step by step explanation of how to prep your Cook Processor and ingredients for the recipe. If you are not using the Cook Processor but want to prepare this chicken waldorf salad at home: scroll down to the second recipe below! How about that? Do you like it? Not bad for a first time, right? Let me tell you: I LOVED IT! The slicer disc is an extremely handy tool if you want to make chopped salads or prepare chopped, grated or sliced vegetables in general. So here’s a full recipe description then: all the ingredients you need, what slicing disc to use, how to insert it into the Cook Processor and start chopping your salad. Enjoy! Chop the apple in half, remove the seeds inside and then slice each half into 6 bits. Then rinse the celery, grapes and lettuce. Slice the cooked chicken breasts into 4 or 5 thick strips: they have to be thin to go through the food pusher. Take the manual adjustable slicing disc and then adjust the slicing thickness by holding the drive adapter in one hand and turning the adjustment collar until you reach the widest thickness. Carefully place the slicing disc in the work bowl. Then close the cover, make sure it is locked into place. Turn on the Cook Processor. Press Time and turn the dial to set the time: select 5 minutes for the chicken waldorf salad. Select Speed 6. Then press Start. Fit the food pusher into to feed tube of the bowl cover. Let’s start the recipe! Carefully insert the celery, grapes, apple, cooked chicken and walnuts into the feed tube. Use the food pusher if necessary, don’t use your fingers! Once all these ingredients are chopped, then press Exit and turn the Cook Processor off. Carefully remove the transparent lid. Then stir the chopped ingredients and add the mayonnaise, half of the lime juice, raisins and a dash of pepper and salt to taste. 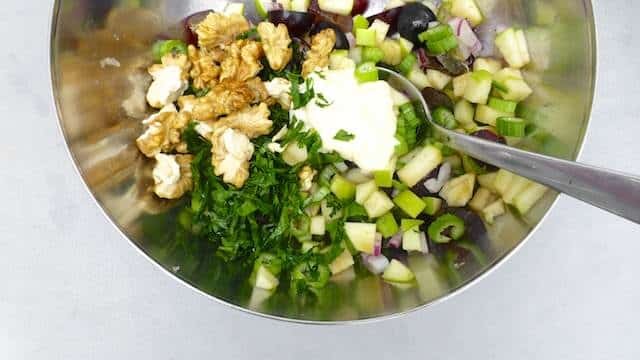 Stir the waldorf salad well. Then check the seasoning and add extra lime juice, pepper or salt to taste if necessary. Divide the lettuce over plates and top with the waldorf chicken salad. Sure you must have heard about this classic chicken waldorf salad recipe before because it’s quite famous! It’s got some history in its background but before we go there let me tell you that I was never a huge fan of fruits in hearty salads – fresh fruits or its dried siblings. Grapes, raisins, dried prunes or apricots. Used to give me the creeps really. But over the years I learned to appreciate these ingredients little by little. This chicken waldorf salad contains grapes and apples, indeed stuff I never would have added in earlier days. But here their fresh and sugary flavor really makes the dish. I also love the crunch coming form the walnuts. I always keep my mayo dressing very light though. 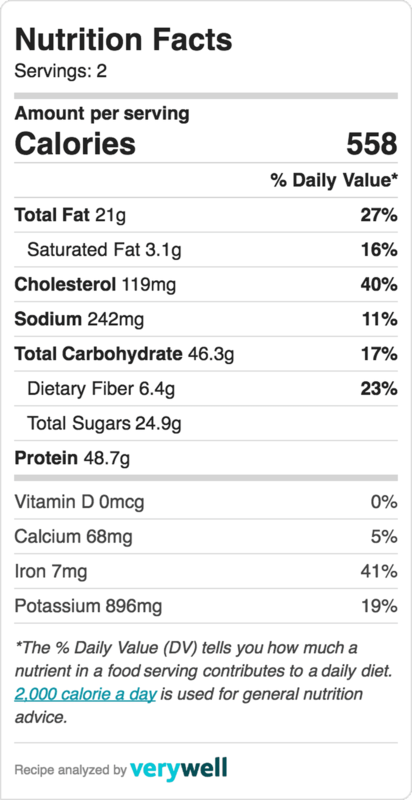 Serve it on some green lettuce as a lunch salad, great! So where does this chicken waldorf salad come from then? It’s name originates from the Waldorf Hotel in New York where this maître d’hôtel (a posh French name for the restaurant manager) came up with the recipe idea at the end of the 19th century and therefore it was named after the hotel. Trust me, I didn’t know that either, got this all from Wikipedia. And indeed, I first heard of it when watching Fawlty Towers! Anyway, enjoy this fresh and healthy salad for lunch as I said or as a great side dish for chicken or pork. Now I mention this, there’s also version of the waldorf salad with (shredded) chicken or turkey in it and cauliflower instead of sliced celery. Love classic salads? Then also check out my classic caesar salad! Anyway, enjoy this fresh and healthy salad for lunch! 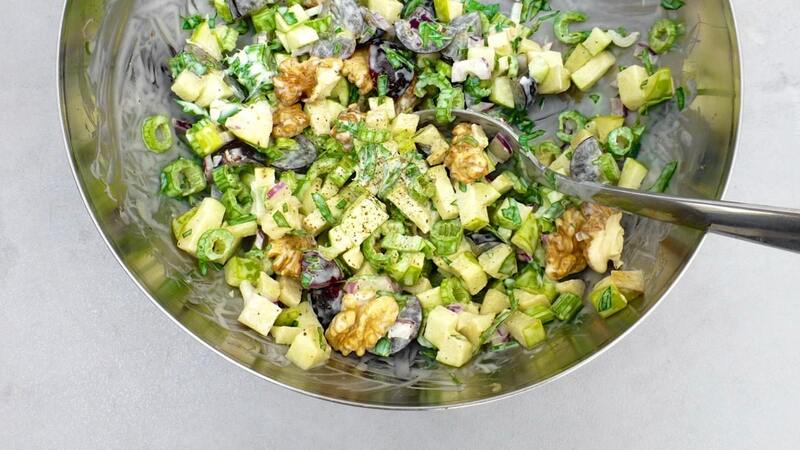 Here's a classic: my chicken waldorf salad recipe! A fresh and easy salad with shredded chicken, grapes, apple, celery, walnuts, raisins and mayo! Slice the apple in half, core it and dice the apple up into bite-size chunks. Rinse the celery stalks and slice them up finely. 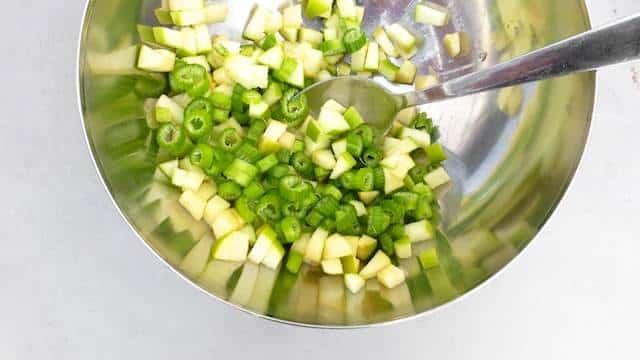 Add the celery and the diced apple to a large mixing bowl. Stir well. Rinse the grapes and slice them in half. Add the grapes to the mixing bowl. Drizzle with half of the lime juice. Stir well. Finely chop the fresh parsley up and add it to the bowl together with the mayonnaise, the shredded cooked chicken and the chopped walnuts. Stir well again. Check the seasoning and add extra pepper, salt, lime juice or mayonnaise to taste if necessary. Stir one last time. Divide the lettuce over plates and top with the chicken waldorf salad. Serve at room temperature.